You wouldn't think that 8 months into the endurance season we'd be riding 3 green unbroke horses. 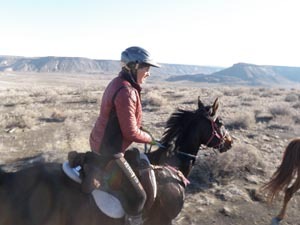 That's about what it was like on loop 1 of the last local ride of the endurance season, the Owyhee Chills No Frills ride put on by Regina Rose. Steph rode her unbroke 2-year-old (OK, 22-year-old) 6400+ mile gelding Rhett, Amanda rode her unbroke 2-year-old (OK, 7-year-old) gelding Chant, and I rode John's beloved unbroke 2-year-old (OK, 9-year-old) mare Sunny on the 50-mile ride. Rhett was being a total Dink for Steph, head up in the air, yanking her arms out of her sockets, and trying to sprint the entire course. Chant was being a total Dink for Amanda, although I couldn't see what exactly he was doing because Sunny was being a total Dink beneath me, cantaloping, trolloping, jigging, gaiting, be-bopping, jigalotting, jigaloping, and pogo sticking her way along. At one point halfway through the loop (you know, when they should have been getting a little tired and settling down), the three of us got off and walked our horses a half-mile, ostensibly to 'stretch our legs' but really to give our horses a little mental time to unwind a bit, and let another group of riders move on out of our sight. 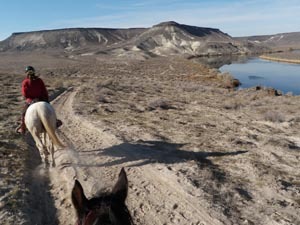 We bounced along very familiar trails along the Snake River, around Wild Horse Butte, and over the Oregon Trail, but a lot of it was a blur. Didn't seem to take much out of the horses though, as Sunny pulsed down at the vet check at 44, and Rhett pulsed down at 48. Rhett is never 48! Instead of vetting, Robert was for the first time crewing for Amanda, and he sent her out on loop 2 on time. Steph and I were… delayed for reasons that have to do with Betty White. It's a good thing the second 25-mile loop was a repeat of the first loop, because I didn't see much of the first loop, for trying to stay on my twerking horse. 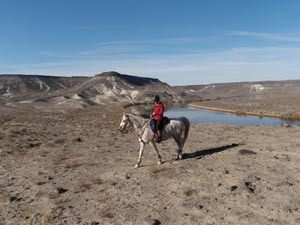 Amanda and Chant ended up on their own ahead of us for 8 miles or so on loop 2, and Sunny and Rhett were Born Agains on loop 2: mature, seasoned endurance horses, trotting along purposefully on a loose rein. Sunny can be so dramatic at times, but here on loop 2, I was riding a totally different horse. In fact, someone should check her tattoo number, because maybe I was riding a different horse, I'm not sayin'. They were both so relaxed and easy I got to witness some pretty spectacular scenery. 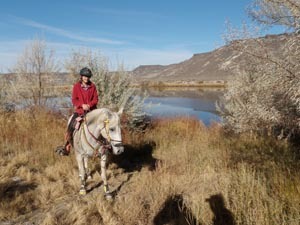 Sure, we've all done the Snake River/Wild Horse Butte loop many times; but this time of year, the Snake is particularly deep blue, flanked with golden grass and the white-leaved Russian olive trees and spotlit by the autumn-angle of the sun in the sky. 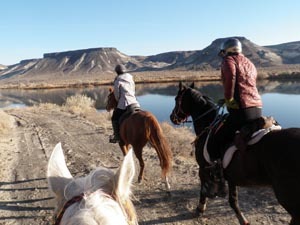 It was around the picture-worthy Snake River Russian olive trees where we turn away from the Snake that Amanda and Chant caught up with some other riders, and we caught up with Amanda and Chant; and we three went back to riding our DINKS for a while. 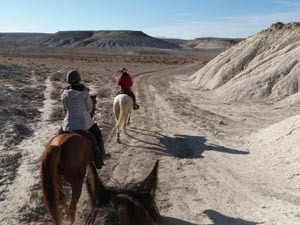 But once the other riders moved on out of sight, soon our Dinks settled down again, and we were back on our fabulous Loop 2 horses. 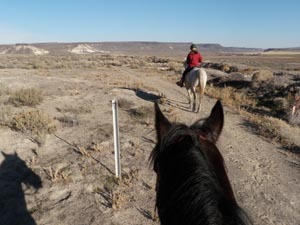 Regina had even found new trails for us (after 7 years or so of these Owyhee rides), over new pieces of Oregon trail complete with old original wagon ruts, and up a nice previously-undiscovered winding wash. We three picked up a nice gallop for a ways on a two-track dirt road, 3 perfectly behaved horses on loose reins, galloping through the golden Owyhee afternoon. Steph said, "I'm sure glad to be us right now!" The horses thought so too! We were back in camp for the finish before we knew it, eating Regina's delicious homemade soup that perfectly hit the spot, and the horses diving into their alfalfa and grain. It was a great season-ending ride (again!). 18 of 20 finished the 50 mile ride, with Beverly Gray and Jolly Sickle winning, and Karen Steenhof (2nd place) and HMR Redstone (Rusty) won BC. 9 of 10 finished the 25, with Cortney Honan and Splendid SR winning, and Janet Tipton and Lady Jasmine getting BC. 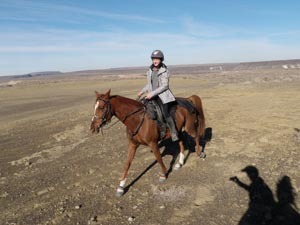 Thanks Regina, and thanks Dr Matt Dredge for driving 3 1/2 hours to vet the ride!